Cousins Liv and Nora decide to take their families on a joint cruise vacation. Everything is lovely until a misadventure occurs while they’re on shore in Central America. Suddenly the kids are missing. This novel was a book club selection from the library, and when I read the synopsis, I was immediately intrigued. I’ve said it before and I’ll say it again: I love books set on cruises. Though the cruise portion of this was only the beginning chapters, I was delighted. It was a perfect depiction. I also loved how close these families were, cousins that are practically sisters, second-cousins who are as close as regular cousins. It reminded me a lot of my family. While so many modern books with thriller or dangerous-edge stories in them start with a lot of unlikable characters, this one started with a cast that I loved wholeheartedly, good people who had flaws but who were generally likable. It was a good beginning. The rest continued to be wonderful. 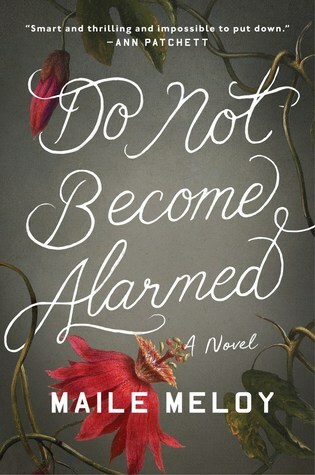 Suspenseful, the kind of can’t-put-down book where you’re horrified and overwhelmed but also completely drawn in. There was enough hope to counter all the tragedy and fear. Meloy struck a good balance. She also did a great job with the psychology, everyone from adults to children and how they dealt with the situation, during and after. I’ve never heard of the author before now, but I’m definitely inclined to read more of her books, especially if they end up being just as good as this one! This entry was posted in 2018, Adult, Prose and tagged cruise, Latin America, POC, portentous. Bookmark the permalink. Sounds like this would be an immersive quick read. I could use a rollercoaster of emotion type of book. I found it was the perfect balance between fully fleshed out characters/story and the quick pace of plot. Thrillers often go too fast for me and are too shallow in the development, and literally book are often too slow in story. This is right in between. I read her middle grade series that starts with The Apothecary and really liked it. Huh, I didn’t see that she had a middle grade series. I wonder if my library carries it. My search results all popped up with adult books but maybe I didn’t look far enough.